Radiation inside one of the damaged reactors at the Fukushima nuclear power facility has reached an "unimaginable" level according to experts. 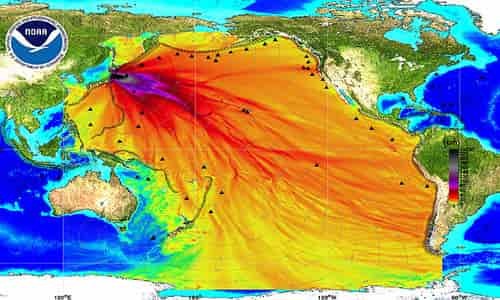 Because so much nuclear material from Fukushima escaped into the Pacific Ocean, there are many scientists that believe that it was the worst environmental disaster in human history, but most people in the general population seem to think that since the mainstream media really doesn't talk about it anymore that everything must be under control. In fact, PBS reported just last year that "it is incorrect to say that Fukushima is under control when levels of radioactivity in the ocean indicate ongoing leaks". The recent reading, described by some experts as "unimaginable", is far higher than the previous record of 73 sieverts an hour in that part of the reactor. New photographs show what may be melted nuclear fuel sitting under one of Japan's wrecked Fukushima reactors, a potential milestone in the search and retrieval of the fuel almost six years after it was lost in one of the worst atomic disasters in history. Tokyo Electric Power Co. Holdings Inc., Japan's biggest utility, released images on Monday showing a grate under the Fukushima Dai-Ichi No. 2 reactor covered in black residue. The company, better known as Tepco, may send in a scorpion-like robot as soon as February to determine the temperature and radioactivity of the residue. More than 80 percent of the radioactivity from the damaged reactors ended up in the Pacific -- far more than reached the ocean from Chernobyl or Three Mile Island. Of this, a small fraction is currently on the seafloor -- the rest was swept up by the Kuroshio current, a western Pacific version of the Gulf Stream, and carried out to sea where it mixed with (and was diluted by) the vast volume of the North Pacific. The estimated value of Kodiak's 2016 haul was $2.21 million, compared to a five-year average of $14.64 million, and in Prince William Sound the ex-vessel value was $6.6 million, far less that the $44 million five-year average. The total state harvest was the smallest since the late 1970s. Although state biologists weren't ready to declare a cause for the poor pink salmon performance, the Commerce Department press release attributed the disasters to "unusual ocean and climate conditions." Not too long ago, I wrote about how the elite of Silicon Valley are "feverishly prepping", but the truth is that all of us should be. Internal radiation, on the other hand, emanates from radioactive elements which enter the body by inhalation, ingestion, or skin absorption. Hazardous radionuclides such as iodine-131, caesium 137, and other isotopes currently being released in the sea and air around Fukushima bio-concentrate at each step of various food chains (for example into algae, crustaceans, small fish, bigger fish, then humans; or soil, grass, cow's meat and milk, then humans). After they enter the body, these elements - called internal emitters - migrate to specific organs such as the thyroid, liver, bone, and brain, where they continuously irradiate small volumes of cells with high doses of alpha, beta and/or gamma radiation, and over many years, can induce uncontrolled cell replication - that is, cancer. Further, many of the nuclides remain radioactive in the environment for generations, and ultimately will cause increased incidences of cancer and genetic diseases over time. Decommissioning the reactors will cost 8 trillion yen ($70.4 billion), according to an estimate in December from the Ministry of Economy, Trade and Industry. Removing the fuel is one of the most important steps in a cleanup that may take as long as 40 years.